Dolly Parton surprised guests on opening day helping launch Dollywood’s season-long celebration of the biggest year in the park’s history! 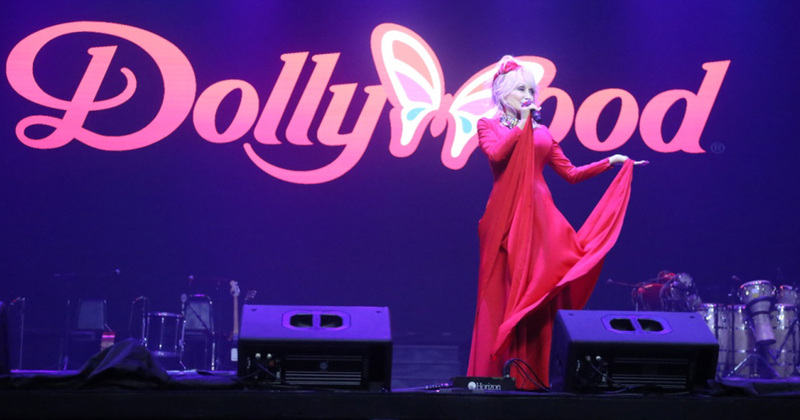 Dollywood’s 34th season—and undoubtedly the park’s biggest ever—opened today with a special preview day for season passholders and a surprise visit from Dolly Parton. In a year that also includes the opening of the largest addition in Dollywood history later this season—the $37 million Wildwood Grove—the award-winning park’s range of unique festival offerings, spectacular shows and memorable experiences make this the best year yet to experience the spirit of the Smokies. Bluegrass fans know Dollywood’s Barbeque & Bluegrass presented by BUSH’S® (May 24-June 2) provides them with 10 days of toe-tappin’ music served up alongside some of the tastiest pulled pork, barbequed chicken and traditional sides anywhere! This year’s festival features an impressive bluegrass lineup with a heaping helping of free daily concerts from an amazing collection of talented performers. Grammy and International Bluegrass Music Association winner Rhonda Vincent & The Rage, IBMA winners Doyle Lawson and Quicksilver, and Dailey & Vincent are just a few of the headliners who make this annual tradition, music to the ears! With the tantalizing treats from Dollywood’s award-winning chefs and the sweet sounds of bluegrass, Dollywood guests have the perfect recipe to kick off the summer! Named the Best Christmas Event at any theme park worldwide for more than a decade, Dollywood’s Smoky Mountain Christmas presented by Humana (Nov. 9- Jan. 4, 2020) provides the perfect holiday atmosphere to put families in the Christmas spirit. Wander through the park’s more than five million holiday lights, enjoy the festive holiday performances and warm Christmas atmosphere, or taste the holiday-themed food, and it is easy to understand why it has become a family tradition for so many. From the cheer and joy of Dollywood’s Parade of Many Colors to traditional holiday shows like It’s a Wonderful Life and Christmas in the Smokies, Dollywood’s Smoky Mountain Christmas helps families create memories to share for a lifetime. Glacier Ridge returns to transport guests to the arctic with the Northern Lights, the Arctic Passage and a 50-ft. tall animated tree. Most of Dollywood’s signature rides and attractions operate in this merry environment. From the award-winning shows and elaborate holiday decorations to the twinkling lights and Christmas-themed menus, Dollywood captures the essence of Christmas.